In mid-summer, the Steeples Mountains "show their stripes" of light and dark layers in their rocks. Irrigated hay fields line the foreground. 0109-59 Steeples with a Telescope. 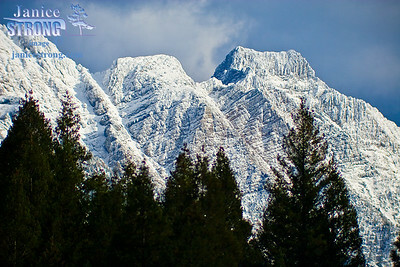 Steeples Mountians of the Bc Rockies with dusting of wind blown ice and snow. 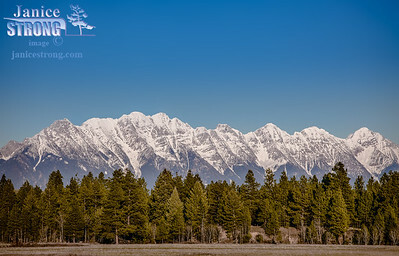 Mid-winter, the low elevation grasslands of the East Kootenay has very little snow, but the high Steeples of the Rocky Mountains are coated in deep snow. It was minus 30 outiside and too cold to ski. 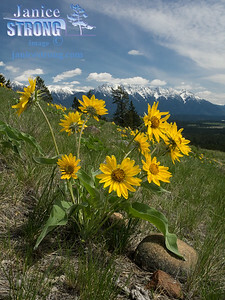 So we photographed the Rockies from the low elevation grassland of Eager Hills. 214_1405 Steeples and Cottonwood trees in mid-winter. 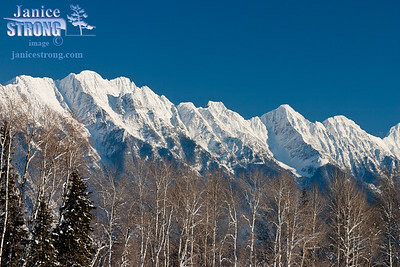 The textures of the bare branches enhances the stark lines of the mountains. Bull Mountian is the highest summit of the Steeples Range. 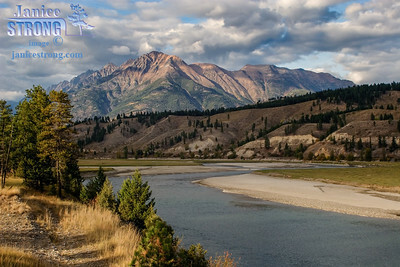 Seen in this photo late afternoon with the Kootenay River, East Kootenay BC. 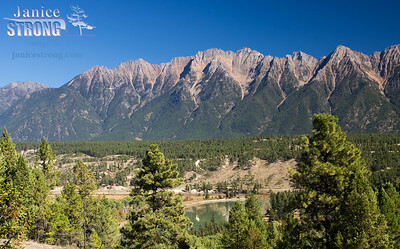 This photo is a panorama combination of several photographs merged to allow this image to be printed up to about 6 to 8 feet wide. The cool shapes to the clouds make this photograph. Combined with a bit of low-valley haze in the Rocky Mountain Trench contributes to this dramatic scene. 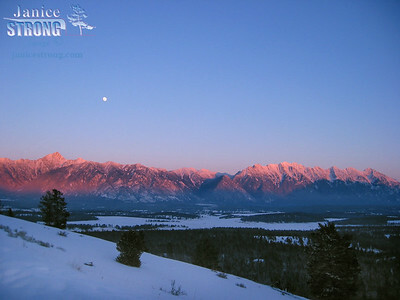 Mid winter alpenglow gives the Rockies a pink glow. 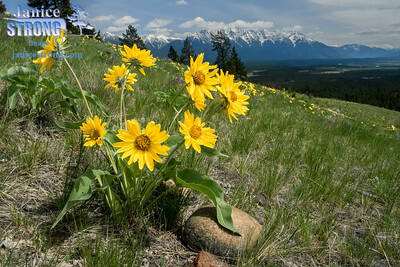 Balsamroot Flowers grow by a warm rock at Eager Hills in the Cranbrook Community Forest southeastern BC. 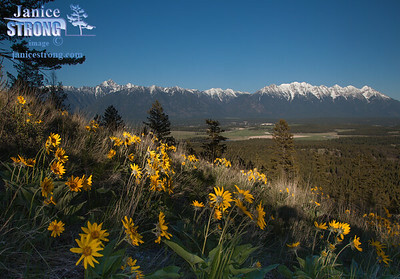 Balsamroots bloom on Eager Hills in the Cranbrook Community Forest just outside the city of Cranbrook, BC, Canada. 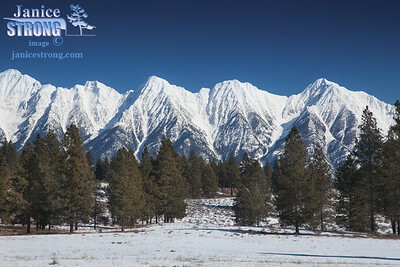 With Fisher Peak and Steeples Mountains. 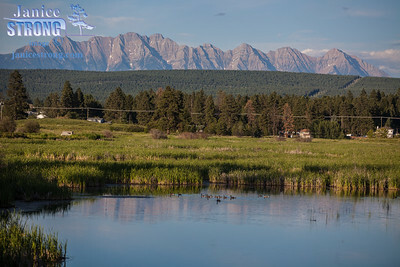 Just outside Cranbrook, BC the Elizabeth Lake is on a "Pacific Flyway" migration route for many water and shore bird species. Fisher-Steeples-Sunset-3704-3705-3706Combined Panorama of 3 images. 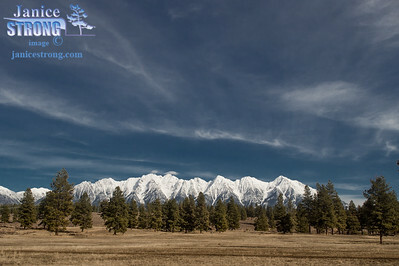 Across the grasslands of Wycliffe BC with the BC Rockies defining the skyline. Changing this generally monochromatic photo to Black and White changed its appeal. It would look great printed to enhance a retro restaurant, business or home. 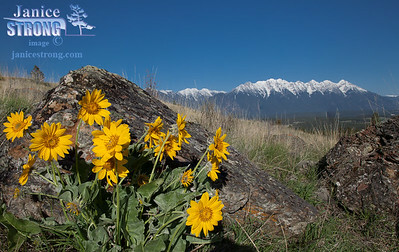 The wildflowers of yellow Balsamroot grow in abundance on Eager Hills in the Cranbrook Community Forest. Springtime with the Steeples Mountains in the background-6028. 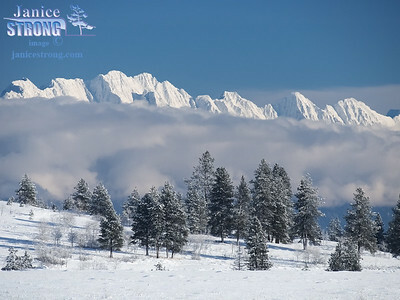 Along highway #3 in southeastern BC rises the Steeples Mountains of the BC Rocky Mountains. 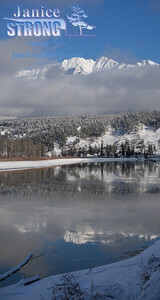 Only the highest summits are seen here covered with mid-winter snow. This would make a nice tall image for a narrow tall space between windows. Mount it on canvas and it wil be spectacular. Early spring in the dry grasslands of the Rocky Mountain Trench with the view up to the Rockies, the Steeples Range. 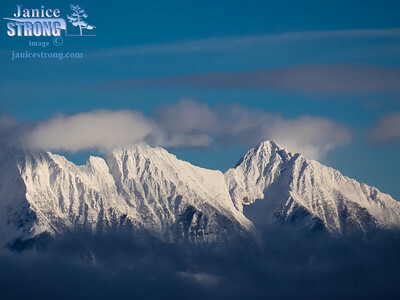 New snow with a bright blue sky on a crystal clear day highlights the craggy summits of the picturesque Steeples Range of the Rocky Mountains, of southeastern BC. 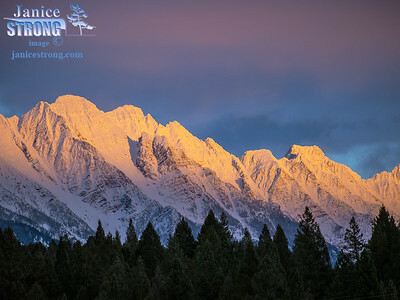 Winter evening alpenglow on the new snow of the Steeples Range of the BC Rockies. 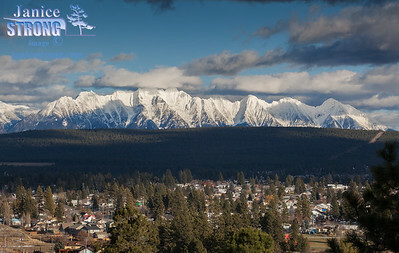 Steeples Mountains with a small part of the City of Cranbrook, BC in the foreground. Contrasts between late melting winter snowpack on the Rockies and dry grass of the valley at Wycliffe. 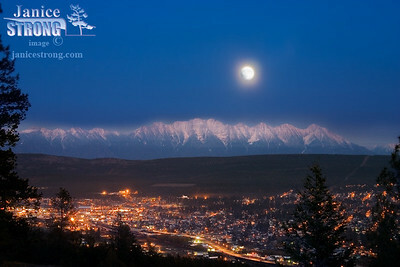 I waited for the moon to rise above the Steeples Range of the BC Rocky Mountains. 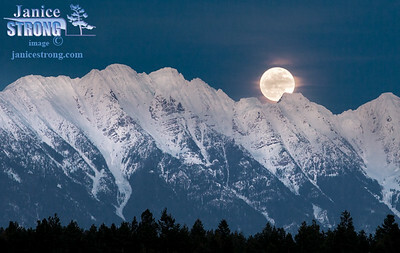 I wondered if the clouds would obscure the scene, but the moon shone brightly over the summits as hoped. 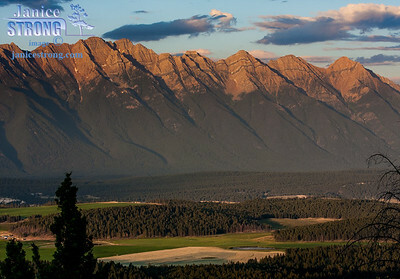 The Steeples Range and a curve of the Kootenay River of the East Kootenay region of BC. 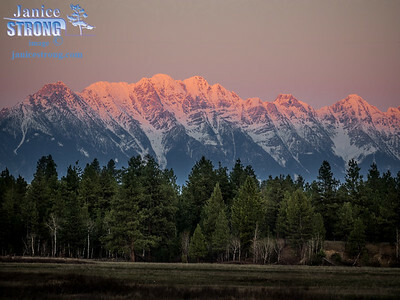 Rocky Mountains lit by alpenglow seen from the Rocky Mountain Trench in early winter. 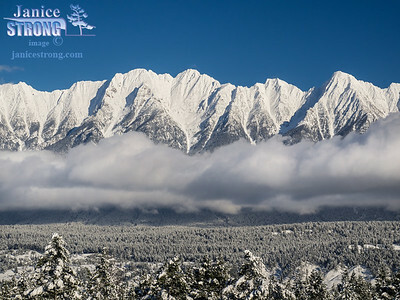 Print up to 37x16 Panorama combined 3 images. 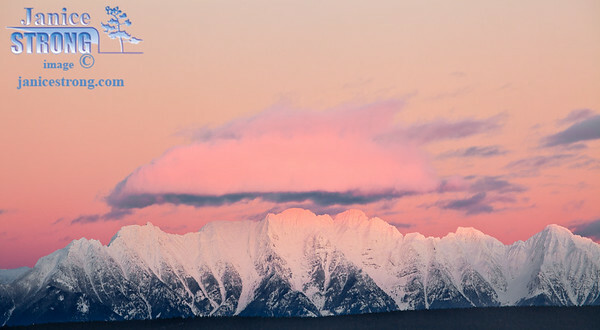 Steeples Winter Alpenglow near the Cranbrook Airport. 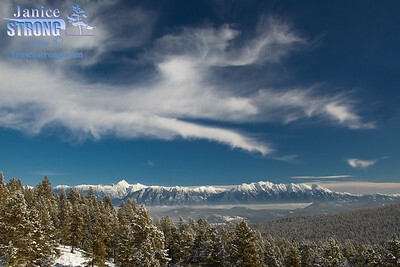 Swirling clouds after a new snowfall and a bright clear day in the Rocky Mountain Trench in the East Kootenay. Only the summits of the Steeples Mountains are visible above the clouds.